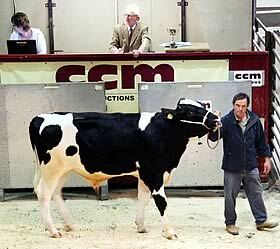 John Walton with his April Craven Dairy Auction champion. John Walton, of Stock Plain Farm, Glasshouses, Harrogate, stepped up on his reserve championship success at the March fixture by taking supreme championship honours for the first time at this month’s renewal with his first prize newly calven Holstein Friesian heifer. Having calved nine days before the show and giving 33 litres, the home-bred product of Mr Walton’s 75-strong commercial dairy herd headed the show prices at £2,400 when joining B Kellett & Son, of Hatton House Farm, Bishop Thornton. It was one of several acquisitions made by the family on the day and at Skipton in recent months, including the two top-priced cattle in March. The farm, run by brothers Glenn and Roger Kellett, is rebuilding its Holstein Friesian herd, which now stands at the 260 mark, with plans to peak at around 280 head of dairy cattle. Their father Bernard is now enjoying retirement. “Even at 87, he keeps an eye firmly on the job and is still a regular in the milking parlour,” said Glenn. The Kelletts also paid £2,050 for the first prize newly calven cow and reserve show champion from West Yorkshire dairyman Stephen Coates, of GW & M Coates, Low Springs Farm, Baildon. Another home-bred, the runner-up, a second calver giving 34 kilos, is a daughter of the Genus sire Comestar Outside. Father-and-son dairymen Malcolm and Robert Swires, of Haverah Park, Beckwithshaw, Harrogate, the most prolific Craven Dairy Auction champions ever, sent out the second prize and top-priced newly calven cow at £2,100, along with the second prize newly calven heifer at £2,300. Both became further Kellett purchases. The third prize heifer from March champion Robert Crisp, of Nelson Farm, Calton, sold for £2,320 to Geoff Blezard, Ribchester, with the same exhibitor also selling heifers at £2,380 and £2,340. Newly calven heifers 1st quality averaged £2,173 and 2nd quality £1,546, producing an overall average of £1,974. 1st quality newly calven cows averaged £2,075 and in-calf heifers £1,260, with maiden heifers selling to £800. The monthly fixture was also enhanced by the sale of four young Holstein Friesian stock bulls, which sold to a top of 1,550 guineas (£1,627) for an entry from the Aireburn herd of Craven Dairy Auction regular Brian Moorhouse, of Hesper Farm, Bell Busk. The buyers were Stephen and Malcolm Abbott, of Dacre, Harrogate. Bulls averaged £1,370. The show was sponsored by BOCM Pauls, with their dairy trophy presented to the title winner by account manager Keith Colley. Judge was Wick Williams, Nantwich.